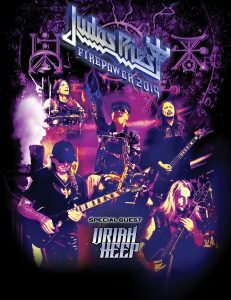 UNCASVILLE, CT (December 3, 2018) – With Judas Priest’s latest studio album, Firepower, confirmed as one of the most successful of the band’s entire career – landing in the “top 5” of 17 countries – demand to see the legendary Metal band in concert is higher than ever. And North American headbangers will get their chance to experience the legendary band on stage this coming spring/summer, when Priest will tour with the classic Metal band Uriah Heep as support. Set to perform live in Mohegan Sun Arena on Thursday, May 16, 2019 at 7:00pm. Tickets are $69.00, $59.00 and $49.00 and go on sale Friday, December 7th at 10:00am through Ticketmaster. Ticketmaster customers may log on to Ticketmaster.com or call Ticketmaster’s national toll free Charge By Phone number 1.800.745.3000. Tickets will also be available at the Mohegan Sun Box Office beginning on Saturday, December 8th, subject to availability. And Priest’s presence and influence remains strong, as evidenced by the chart performance of Firepower and its glowing reviews, a Grammy Award win for “Best Metal Performance,” plus being a VH1 “Rock Honors” recipient and a Rock and Roll Hall of Fame nomination. For more information, please visit judaspriest.com.